Body piercings can be both very beautiful and unique. 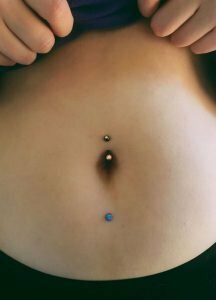 Dermal piercings and surface piercings offer a very different look because they don’t have a separate entrance and exit point and just stay on the surface of the skin. The jewelry lies along the surface and is held in place by an anchor located just below. Both types of piercings offer a creative way for an individual to express themselves using a wide variety of jewelry and accessories. we do dermal piercings using the needle method. Dermals are single point surface piercings which differs from the traditional surface bar piercing. A needle is used to create a small hole in the skin and then the dermal anchor is inserted. In most cases, the base of the dermal anchor is about 6 or 7 millimeters long, just enough to secure the post and hold it in place. 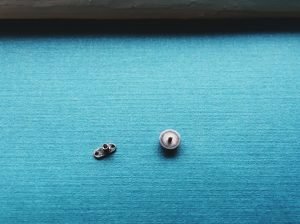 The dermal boot has holes in the base for the tissue to heal around and grow through which helps secure and stabilize the jewelry in the piercing. Once the piercing is done, you see only the decorative top of your choice on the surface of the skin. This exposed piece on the surface of your skin has internal threading, making your jewelry top interchangeable. One of the most important pieces of information regarding microdermals is, if the piercing is healed and you want to remove the piece under the skin for any reason, it can easily be done by a trained piercer with minimal discomfort. You can not take dermals out on your own. Attempting to remove dermal anchors by pulling them out can be quite painful. If you’re interested in getting a dermal piercing and want to view some of our jewelry options, please visit our web store. 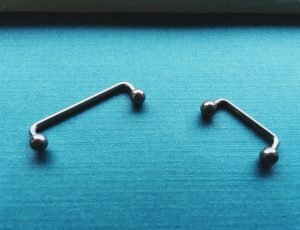 Surface piercings are anchored using barbells that are shaped like open staples. A hollow needle is used to pierce the skin and act as a guide for the barbell to be inserted. When it has been properly positioned, decorative jewelry tops can be put in place. A surface piercing is more invasive than a dermal piercing because the barbell must be guided under the skin for a specific distance, while a dermal has just one point of entry. Surface bars tend to leave much larger and more obvious scars if the piercing rejects or migrates. Dermals and surface bars are often used on areas of the body such as the hips, above the cheek bone, chest, nape of neck, lower back or anywhere else a person chooses to place them and has enough skin of moderate thickness to pierce. Surface piercings and dermals allow a person the freedom to express themselves in any number of ways. Because they do not penetrate through the body, they can be placed virtually anywhere. Just like any other type of piercing, both dermals and surface piercings must be properly cared for. With proper care, they typically heal quickly and efficiently. As with any other body piercing, we recommend non-iodized sea salt soaks and glycerin soap washes to help heal your new piercings. Read our post on how to use the aftercare products we suggest. If you’re interested in purchasing aftercare for your new piercing, visit one of our Almost Famous Body Piercing store locations or order from our online web store. When you receive a dermal piercing, it’s important to wear a band-aid for the first two weeks. This is to hold the top flat against the skin so that the tissue can heal around it and create an anchoring effect. Both dermals and surface piercings can be very painful when snagged on hair or clothing, so it’s imperative that you choose a place on the body that isn’t mobile or you can choose to be continually conscious of the area in which you choose to be pierced. Visit Almost Famous Body Piercing to see a full line of jewelry for both dermal and surface piercings. We offer quality jewelry at affordable prices. With our wide selection, we have something for everyone!